Before renting the machine you will need to complete a certification class. 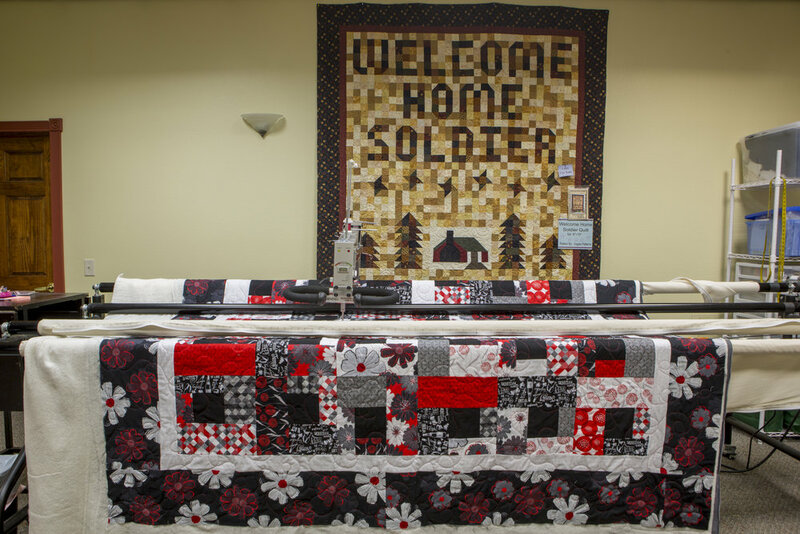 This is where you will learn how to thread the machine, wind the bobbin, and load the quilt with our quick zipper system, as well as how to operate the machine. Some quilting techniques are covered. You will have about 1 1/2 hours during your certification to get acquainted and practice on the machine. After this class, you want to use part of your first rental session to develop your skills before quilting your first quilt. THE CERTIFCATION CLASS FEE IS $65. THIS COVERS THE 2 1/2 HOURS OF CLASS AND PRACTICE TIME. PLEASE CHECK FOR AVAILABLE TIMES. The use of a cleaned and oiled, state of the art APQS long-arm quilting machine with a stitch regulator. You may use our bobbin cases, although we highly recommend that you purchase your own case(s) so that you can keep them adjusted to the threads you most frequently use. rental session fees: $20 an hour with a 2 hour minimum. what is not included in my rental fee? Pre-wound Bobbins - $1.50 each - solid colors only. Batting - We carry Hobbs Heirloom 80/20, Warm and Natural and polyester. You can bring in your own batting or purchase it from us. Just ask and we can help you find what will work best with your project. Backing - We carry 108" & 120" backing in a variety of colors. no food, drinks, or children under the age of 16 will be allowed in the machine room.